The wind whispers past the wings and we steepen the bank to near 60 degrees. We are at 3000 feet and climbing at more than 300 feet per minute. The thermals are building with the afternoon heat. Three hawks are circling with us in a thermal just west of the airport. They don't seem to mind sharing the sky and we admire their effortless ability to stay in the lift. I wonder if their flight has purpose, or are they, like us, just out to enjoy the view. For the last year I have been frequenting a number of gliderports with two goals in mind. I wanted to add a commercial glider rating to my ticket, and along the way I have started something of a personal photo project, documenting this corner of the aviation world, experienced by only a small percentage of general aviation pilots. I visited with, photographed and piloted gliders at a number of places during the year, mostly smaller, rural operations. The flying and photography does not include dramatic mountain scenery and high performance fiberglass ships you might see in a glossy magazine or on a calendar. This is a more intimate view of weekend fliers, working to squeeze maximum performance out of older machines. Pilots passing on their knowledge and experience to a new group of aviators. The goal on any given day is to get a club member soloed, not set a world record; to enjoy the day, the sky and the good company of fellow glider pilots. The aircraft are not new or sleek. The venerable Schweizer 2-33 and the single place S-1-26 appear often, as does the Blanik and the Lark IS-28. These ships are towed aloft by aging ag planes that have found new life and purpose after being retired from their original mission. There also seems to be a large number of retired pilots in this group, no longer worrying about traffic delays and weather, just wanting to stay active and in the air. Come along and share a season of soaring by looking through my notebook and viewfinder. Who knows, you may find it inspires you to find a glider, a thermal and some excellent company along the way. By the mid 1970's the U.S. market for piston powered ag planes had come to an end. The backlash against spraying pesticides, as well as the economic factors brought production of these airplanes to a halt. Some of these aircraft found their way to Central or South America, many of the remaining ones have found homes as tow planes for glider clubs or commercial operators. Piper Pawnees and Cessna C-188 Agwagons are now found towing every type of glider, with engines ranging from 235 to over 300 hp. These retired sprayers soldier on, year after year, towing glider pilots into the air looking for that elusive lift that will keep them airborne for just a little longer. This Piper Pawnee is used daily for towing at Seminole Lake Gliderport. Weighing in at only about 500 pounds, the single place Schweizer 1-26 offers glider pilots solo flight experience. Checkout is an extended ground briefing, orientation, and a good luck wave. These small sailplanes have a 26:1 glide ratio with a best L/D speed of 42 knots. Seen here is a 1-26 operated by the Merlin Soaring Association at Merlin Aerodrome, near Richmond, Virginia. Before you can begin soaring, you have to get the glider in the air. Typically tows are to 3,000 feet unless otherwise arranged. Most operations in the U.S. utilize aero tows rather than auto or winch launches. Here the Lark IS-28 begins its climb behind the Cessna Ag wagon. Liftoff takes only a few hundred feet with climb to 3,000 feet taking about five or six minutes once airborne. On a good day the short tow may result in a flight of several hours. My soaring year started in September. By January it was getting cold in Virginia. A daily high of 30 degrees with 20 knots of northwest wind will send even the most dedicated glider pilot indoors, or south. In my case I chose a heading of about 200 degrees and ended up at Seminole Lake Glider Port near Orlando, Florida. Spending four days in the sun, with the daytime high averaging better than 78 degrees, is a great way to recharge and enjoy some soaring. 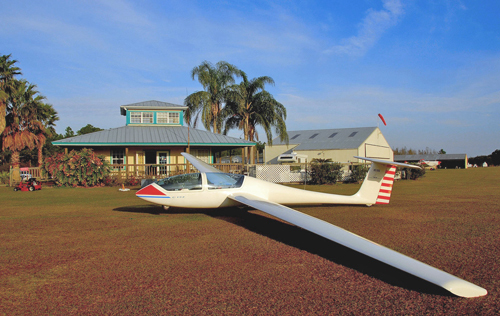 The Grob 103 pictured here sits in front of the Seminole Lake clubhouse/office. Limited RV camping is available at Seminole Lake as well as rooms in the Clubhouse. A 3000 foot grass strip and a great full-time staff of instructors and tow pilots make this a good choice for winter training or a getaway. Just as the Cessna 150 was the primary trainer for a generation of powered aircraft pilots, the two place Schweizer 2-33 was the primary trainer for glider pilots during the same time period. Like the C-150, the 2-33 continues on as a trainer and inexpensive club aircraft. These tandem gliders have metal wings, fabric covered fuselage and spoilers for glide path control. The 2-33 is neither sleek nor particular pretty when put next to the modern glass sailplanes but it remains a fun and inexpensive way to get started in soaring. Both my first solo and checkride were taken in the Schweizer. Good tow pilots are critical to the safe and successful operation of any glider operation, be it a commercial operation or a club. 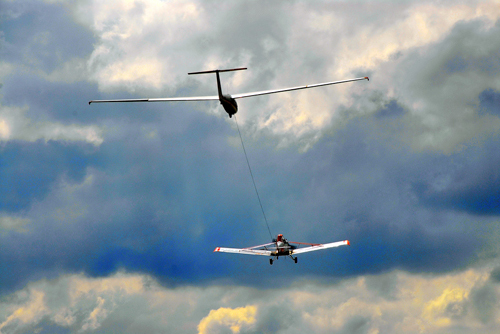 Towing gliders requires specific advanced training and a logbook endorsement. A good tow pilot can make the ride to altitude a walk in the park. This Cessna C-188 is towing an S-2-33 at Merlin Aerodrome. 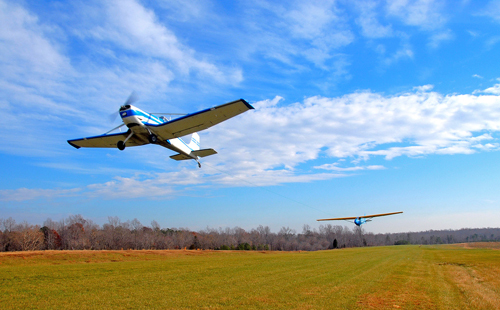 Many glider pilots also qualify as tow pilots and instructors so that they can do double duty at the local club. Give me a sailplane and a grass runway, a little thermal lift, and I can be happy all day. In the early spring the grass turns thick and a lush green, acting as a cushion for touchdowns, making my landings feel better than they actually are. As the day heats up, the grass is much more pleasant than a paved surface and you can picnic right next to the touchdown zone, grading the landings of your fellow glider pilots. 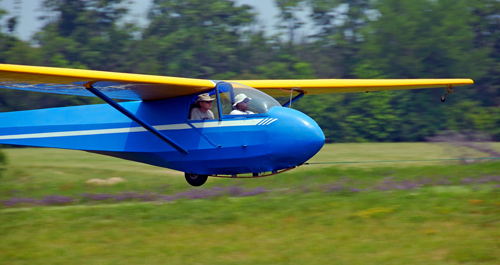 Most gliderports share the grass with at least some powered aircraft. I have always found my powered flight brothers careful and considerate in our shared space, perhaps they are thinking about landing their craft without power and instinctively yield to their long wing colleagues. Moving up from primary training in the 2-33 to the Lark is a real eye opener in terms of understanding glider performance. The much improved glide ratio, increased weight, flaps and retractable gear remind me of the transition from a Cessna 172 up to retractable high performance powered craft. The spoilers which can be seen here fully deployed for landing are extremely effective allowing greater flexibility in the pattern. By August central Virginia has become hot and humid with the summer haze limiting visibility and soaring fun. Time to head north and try out Sugar Bush Soaring in Vermont. Soaring in different locations is a great way to build your knowledge base, seeing how different terrain impacts glider performance. The mountains surrounding Sugar Bush require a different mindset than flying in the relatively flat terrain of Virginia or Florida, but they open great opportunities for ridge soaring and wave operations which can lift gliders to 20,000 feet or more. My brief mountain gliding experience brings me to the end of my first year of soaring. I have added the commercial glider rating I set out to acquire. I've had fun with this personal photo project, but most of all I have made some great friends along the way who have been generous beyond belief in sharing their knowledge and experience with the new guy at the field. My thanks to all the great pilots I have had the honor to soar with during the last year. Finally, thanks to the family of hawks that live somewhere near Merlin Aerodrome who were so kind as to share the lift with me in a thermal one summer afternoon. I will long remember and treasure your company. Visit www.barnstormers.com - post an ad to be viewed by over 500,000 visitors per month.